In April 1999 the art brut artist André Robillard showed an exhibition at the art club ‘Kunstverein Baden’ near Vienna in Austria – invited by the art collector Eric Moinat. This film features some impressions from the vernissage evening – first at the gallery and then at a ‘Heurigen’ wine tavern, where the gallery folks went after the opening. 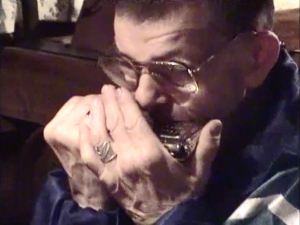 André Robinard sings and plays on his mouthorgan – and that’s what this film is about. Martina Funder, chairwoman of the Kunstverein Baden at that time, filmed a few scenes of that evening with her camcorder. This historical material was edited and post processed by Dag Travner in 2015.